Best of the Tales, "Chicago Values" was first published on July 30, 2012. So, the mayor of Chicago, Rahm Emanuel, shows visible anger as he denounces the Chick-Fil-A fast food restaurant chain and tells them they are not welcome in his city because his city has certain values. This all stems from the fact that the founder and CEO of Chick-Fil-A, S.Truett Cathy, is a Christian who says that he believes in the Judeo-Christian traditional definition of marriage: that marriage is between one man and one woman. "Horrors". Rahm Emanuel said in outrage, "Chick-Fil-A's values are not Chicago values." 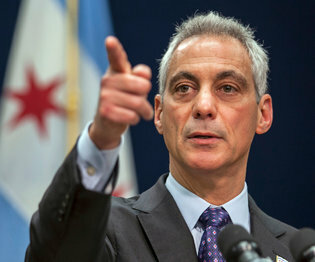 Mayor Rahm Emanuel -"we have Chicago values to uphold"
The very next day, after Rahm said that Chick-Fil-A does not meet the high standards that the city of Chicago has, Rahm welcomed with open arms Louis Farrakhan and his Nation of Islam followers. Farrakhan said the Nation of Islam will be there to help clean up the streets from all the senseless killings and random violence. Yes, the same anti Semitic, anti white, hate filled bigot is welcomed with open arms by 'Chicago values' Rahm. I guess Louis and his band of the Islam nation have values that are right in line with those wonderful Chicago values that Rahm is concerned about. Rahm might say while he doesn't believe in every one of Farrakhan's vile, bigoted anti Semitic rants, he, being the tolerant liberal he is, recognizes there is freedom of speech in this country. Besides, I am sure mayor Emanuel might say, everyone knows how tolerant and fair minded Farrakhan and the Nation of Islam is to gays, unlike those evil Christians. But what about the CEO of Chick-Fil-A's right to freedom of speech? Rahm might say about that....'freedom of speech only goes so far. Saying you believe in traditional marriage is like yelling fire in a crowded theater'. Yeah, you have to love those fair minded, tolerant, free speech liberals. Oh, those valued Chicago values. Dirty, corrupt, violent, thuggish murder capital of America-there aren't many cities that can compare to the values Chicago has. Now that I think about it, Rahm Emanuel is 100% right. Chick-Fil-A and their clean cut, polite, family oriented, traditional values restaurants certainly do not represent the values of Chicago. Well I live in Houston, Texas where we do welcome Chick-Fil-A with open arms. Well said. And to celebrate what would have been my Mother's 100th birthday on August 1 & will be my daughters 35th birthday we are going to eat breakfast, lunch and dinner at Chick Filet! Woo Hoo .... Great way to celebrate your Mom and daughters birthday! That's so cool both are on Aug1! Happy birthday to your daughter!! !